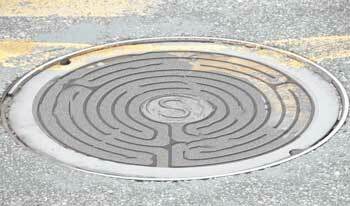 When your focus is about the labyrinth, they seem to show up everywhere. From the simple Greek Key design to a fully walkable permanent design; we can find them in society and nature. The geometric shapes become more plentiful and seem to be represented in pattern and fabric and over the years I have found them in the most interesting of areas and places I wouldn’t really expect. Meanders in nature and design, clothing and architecture are really more common than we might think. Look up, look down they are all around.